You’ve done it! You found the best deal going on a 75-inch LCD TV. At the local electronics store you found a Wazeemajob brand TV for $750.00. It’s a 4K TV with great image reproduction and refresh rates to beat half of the TVs in the market. Better yet it’s selling for almost half of the middle of the road TV. Something is eating away at you as you ponder purchasing this monster. What is it? Could it be the risk that this TV will last 13 months and be headed for the local electronics recycling depot? Or worse yet you buy it and the store you bought it from went bust? For as long as retailers have existed there have always been varied, and different approaches to gaining market share and selling more products. It just happens that we have a very defined approach to how we go to market. We know that you are more likely to come back if you can get the best quality and the best service for the most reasonable cost. Here is our best description for what we do. If you look at a triangle you can see that only two sides can connect at one point. 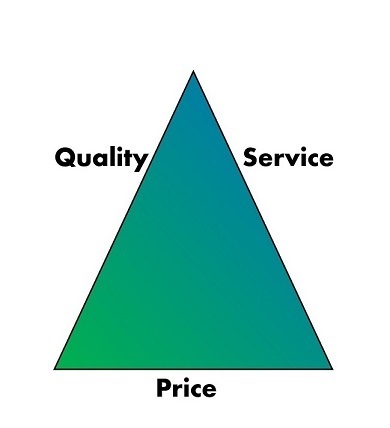 The Quality, Price and Service can’t be the best no matter which way you slice it. You can’t buy the best TV for the lowest TV price. The Samsung will never sell for the same price as the Wazeemajob TV. Nor will the quality of the Wazeemajob TV match the Samsung. We all know that. Our clients expect value. They expect quality and most importantly…. they expect service. We combine quality and service to produce the best value for our clients. That is our priority. Personal Protective Equipment- Wear it!